Allergy season in Austin is apparently all year round. Between humidifiers, decongestants, and vapor rubs, I was looking for something a little more NATURAL to bring into our stuffy-nosed home. Radiantly You was started by a Certified Holistic Health Coach and her company is all about natural, chemical-free products for your home and family that are also cost-effective. Score! 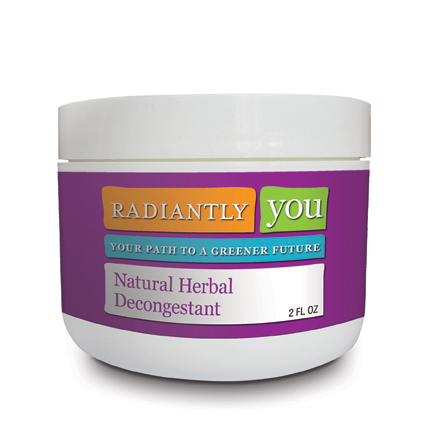 Radiantly You Natural Herbal Decongestant is perfect for year round, this petroleum free, 100% natural vapor salve is safe for the entire family. It is great for easing cold/flu symptoms and sinus/respiratory congestion. Hello, Austin people, this is for you! The scent is fresh and invigorating with a strong and soothing smell coming from the ingredients of eucalyptus, lavender, and peppermint. Yum! The ingredients are combined in a smooth, petroleum-free yellowish salve to help ease cold or flu symptoms. The decongestant is safe for the entire family to use on the chest, throat, under the nose, or on the bottoms of feet. The label recommends that young children use it on chest and throat. My oldest daughter, who seems to have the worst allergies in the family, loves the smell and it has become a nightly ritual to apply. We may have to move out of Austin to completely stop the allergies for our family, but it’s nice to know that Natural Herbal Decongestant is a wonderful all-natural way to keep the sniffles and stuffiness at bay. Detoxify the life you live. To apply: Rub thin layer on chest and/or throat. Even massage into the bottoms of the feet or a dab under the nose. For external use only.